Hillary Clinton's new book on her views of the presidential election sold 167,000 hardcover copies in the U.S. alone during its first week. Almost a year after the U.S. presidential election, some still want to hear Hillary Clinton's take on why the race ended like it did. Her new book titled "What Happened" sold 167,000 hardcover copies in the U.S. during its first week on sale. Clinton's publisher says that makes for the best first week of any "hardcover nonfiction title published since 2012." And Simon & Schuster says it expects the orders to keep coming; it says it already printed 800,000 copies. In the book, Clinton explains why she thinks she lost the election. She partly blames former FBI Director James Comey for reopening the infamous email investigation near Election Day. She also points to racism and sexism. And she thinks Russian interference in the election worked against her. Clinton criticizes the media, members of her own party — like Bernie Sanders and Joe Biden — and of course, President Donald Trump. But Clinton also takes some personal blame for the loss. 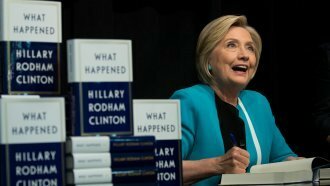 The president and CEO of Clinton's publisher said sales for "What Happened" show "there is clearly an overwhelming desire among readers to learn about and experience, from Hillary Clinton’s singular perspective, the historic events of the 2016 election."